Frequently, women may feel a new breast mass while showering and conducting their monthly breast exams. First and foremost, do not panic if you notice a new breast mass. The majority of breast masses (80%) that are found, worked up and diagnosed are actually benign, meaning they are harmless and a part of normal breast architecture. Lumps in the breast are common and more common in younger patients where the breast is denser and with less fat. That being said, it is still prudent to seek a health care provider to assure that the new mass is not something worrisome like breast cancer. Breast tissue naturally has a lumpy bumpy texture. Breasts are made up of fibrous connective tissue, glandular tissue, blood vessels, fat and a complex network of ducts and lobules where breast milk is made. This intricate network contributes to the lumpy-bumpiness architecture and can be more pronounced in some individuals versus others. If the mass is tender and fluctuates in size or comes and goes throughout the month, it is less likely cancerous or malignant. Some lumps will appear and disappear at different times in a menstrual cycle as hormones are fluctuating in a woman’s ovulation cycle. Breast cancer masses tend to be of one size, non-tender and stay the same size regardless of time of month. They will also likely grow in size over time versus benign masses that tend to stay the same size. Breast masses can further be categorized as either fluid-filled or solid. Solid masses can represent a whole host of different diagnoses, most of which are benign as mentioned above. Breast masses can also be fluid filled, called cysts, which are very frequent. Another good rule assesses whether a mass is fixed or mobile. Masses that move and are not tethered tend to be benign masses while painless masses that are fixed and harder to move around tend to have more cancerous characteristics. While this is just a good rule of thumb, every breast mass should still be checked out by a qualified health care provider such as your OB/GYN. 80% of breast masses return back with a benign or normal diagnosis. Most of these masses are a result of the fluctuations in hormones as they build up in your body with your monthly period. Below are the most common benign breast findings. When examining a breast in depth, such as a self-breast exam, masses commonly felt are just normal rubbery lumpy bumpiness. These are normal findings and it is very infrequent to actually have a breast that is completely soft with no rubbery findings. These normal fibrocystic findings will change throughout a woman’s lifetime and fluctuate with the time of month, diet and medications such as birth control pills. Any fibrocystic changes that appear all of a sudden and new or new masses that were not always present should be evaluated by a qualified medical practitioner. 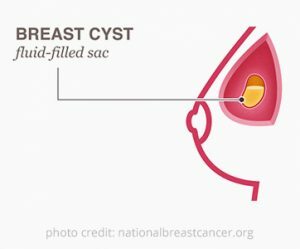 Cysts are fluid filled sacs that can resemble and feel like solid breast masses. They are typically small (less than 2 inches) and do not usually grow to large sizes. Cysts can affect any woman at any age however, are more frequent in the age range of 35-50. They will frequently fluctuate throughout the course of a menstrual cycle and can be tender as they increase in size because of the tension the fluid may place on the cyst itself or the mass effect that it causes on the surrounding normal breast tissue. Cysts are typically diagnosed with an ultrasound and can aspirated by the radiologist or your OB/GYN doctor if symptoms such as pain persist. Frequently, they can be left alone if it is not bothersome and just a normal benign finding. 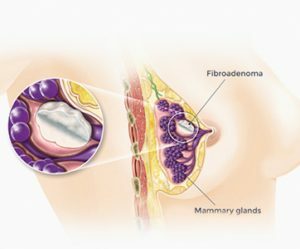 Fibroadenomas are perhaps the most common masses that are found in the younger patient populations, typically in the range of 16-30 years old. This benign tumor can be a variety of sizes that range from those that are not even palpable to those that can be several inches long. As mentioned earlier with benign findings, they are usually mobile and can fluctuate in size throughout a menstrual cycle. Fibroadenomas should be evaluated and frequently, left alone if such a benign diagnosis is confirmed by the OB/GYN and ultrasound/biopsy confirmation. Although not a true breast mass, a clogged mild duct can lead to a large, swollen tender breast that can be worrisome. This commonly affects women who are breast feeding after pregnancy and can be treated with antibiotics, warm compresses, and manual manipulation to clear the clogged duct. Any trauma to the breast can result in permanent damage and scar tissue. 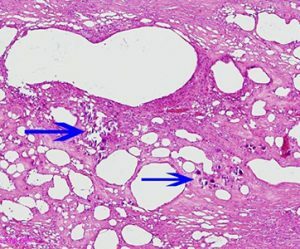 In the breast, this commonly manifests as fat necrosis. The damaged breast tissue and fat take up calcium in the body when it is permanently damaged resulting in a firm permanent finding that can be felt like a lump. These masses are very infrequent and will not change in size or time of month. All breast lumps should be taken seriously and warrant evaluation for peace of mind as well as to diagnose the 20% that may wind up being of cancerous concern. The masses that are presented in this article touch upon those that are most common and most likely to return back as a diagnosis from your OB/GYN. The next article will focus on the screening modalities that an OB/GYN will order to further evaluate your breast mass in order to reassure you.